Two things people should know: Gentlemen, don’t try to come between a woman and her horse. You’re always going to be third in that triage. Ladies, don’t give your man an ultimatum when it comes to the boat. Some things in life are truly sacrosanct – boat and horse ownership are two of them. Today, we’re talking boats. 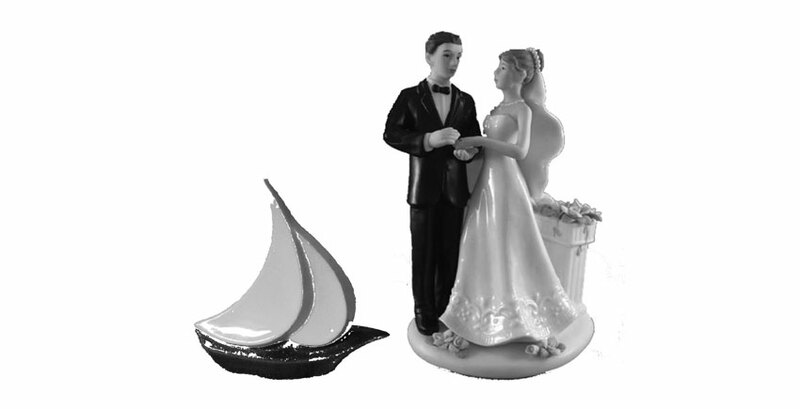 More divorces happen during the first few years of boat ownership than at any other time. This is because for many, a boat is more than just a boat. People get extremely emotional about that floating piece of plastic or metal. Somehow this object of adoration becomes a mistress, an enchantress, a goddess, an enslaver, an addiction, an extension of one’s soul. It devours one’s money and time, and in exchange, it tantalizes with the promise of adventure, excitement, escape, prestige, paradise, camaraderie and red sails in the sunset. We’re talking serious emotions here. In most relationships, one of the partners, usually the male, loves the boat far more than the other partner loves the boat. Perhaps the boat was there before the significant other came along. Perhaps the boat devoured years of the man’s time while he lovingly and painstakingly built his vessel of pleasure. Or, it could be that the couple enthusiastically bought the boat together, but one of them languishes in their adoration. The fact is, no matter what the circumstances of the boat’s arrival, make no mistake – the vessel is a third party in the relationship, and it’s a party that can, and often does, drive a wedge between two people. So, what is the secret to keeping your boat and spouse too? Here are a few simple suggestions gleaned from over thirty years of observing people struggle to keep their marriages and boats afloat. Don’t minimize your wife’s (significant other’s) fears. Recognize that anyone who has fears about setting off to sea, or across the straits, in a tiny craft is a very smart, logical person. If we’re going to be totally honest, it’s really kind of crazy to journey on a small vessel with no land in sight. It’s okay to be afraid…it shows good common sense. What you’re doing IS dangerous, for Pete’s sake. To help the fear issue, invest in boating classes and YOU STAY OUT OF THE CLASS. Teaching your wife/girlfriend to sail or power a boat is like trying to teach her to drive. Some things are just better left to experts or, at the least, total strangers. Encourage your “mate” to actively participate in running the boat. She should at least know how to do absolutely everything that you can do, whether that be raising sail, setting anchor, steering or charting courses. You’ll need her to be capable of handling that boat should something happen to you out in the middle of nowhere! Let her become the expert at something and I guarantee she’ll feel better. Along with this, make sure that your mate has the opportunity to participate in the planning of your excursions and in the purchasing of equipment and boat décor. It’s called ownership. Don’t just relegate her to the galley. Puleez do not yell. Raising one’s voice in an excitable moment or in a howling gale is one thing; that’s not the yelling I’m talking about. You know the difference, and so do the people on boats a mile away who hear you. It’s all in the tone and facial expression. Yelling is never acceptable. Take the time to communicate.Spending hours alone together is a great opportunity to talk…that means you say something too. Playing games while traveling, like Cribbage, Chess or Scrabble, can be a nice way to relieve tension and build a closer relationship. Have book discussions. Share your hopes, beliefs and dreams, and no, that’s not too touchy-feely. If you always must travel with an entourage of friends, you’re already in trouble. Don’t expect your mate to harness herself into a bucking bronco of a pounding vessel and prepare a three course meal. When you have to eat dinner out of the can, don’t complain. One of the fun times we had when traveling was to gamble almost every day to see who had to do the dishes or any other looming chore the next day. My husband even took up baking, something I find tedious and boring, and he produced mouth-watering, heavenly treats on a regular basis. At least once a day laugh, be playful and have fun. Sometimes we become so intense in our journey that we become tense. You don’t need to ha-ha your way around the world, but lighten up and you’ll probably see your mate brighten up. Ladies, don’t do your spouse a disservice by proclaiming your love of boating before you’re married, and then have an about face. The call of the sea is strong and mysterious. You may find its call is stronger than yours. Becky Coffield is the author of the award-winning sailing adventure, Life Was a Cabaret: A Tale of Two Fools, A Boat and a Big-A** Ocean as well as the award-winning suspense novel Northern Escape. Her newest release, One Pot Galley Gourmet is currently available at Captain’s Nautical Supply and on Amazon.com.